Favorite Fall salad is an easy side or main dish. Whisk the olive oil, balsamic vinegar, brown sugar, salt, and pepper together. 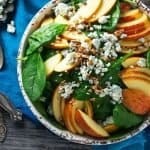 In a large bowl toss the spinach, apples, blue cheese, toasted pecans, and prepared dressing all together and serve right away.